Home Fake images food agriculture genetically modified chickens genetically modified strawberries GMO McDonald's baby food Misleading claims Organic water pesticides Red onion myths USDA Organic "Oh Be Careful Little Eyes What You See.."
"Oh Be Careful Little Eyes What You See.."
So what's wrong with this picture? See the USDA Organic seal in the lower right corner? 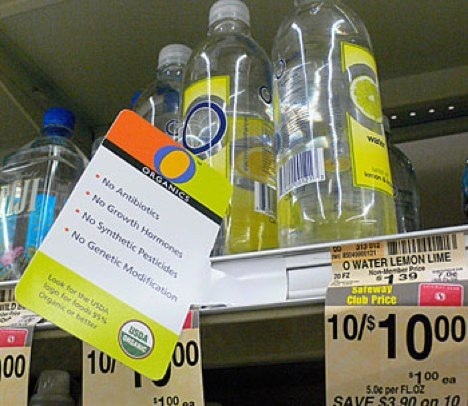 Water cannot legally be labeled organic. The USDA National Organic Program (NOP) does not allow water to be certified as organic so the use of the label in this picture is a fraud. If you think about it, things that are literally defined as "organic" must contain carbon. Water has 2 hydrogen and 1 oxygen molecule, ... no carbon! If you see water labeled as organic in a store, it is false advertising. If you see it on the internet, its probably a fake. What could possibly be wrong with this picture? It's not the picture, its the content of the article that goes with it...It advises that placing cut onions in bowls around the house will result in the onion absorbing viruses and no one will get the flu.The claim is that onions are a magnet for viruses. Then the article accuses onions as being a huge culprit toward food poisoning. It continues on to say that day old cut onions are poisonous and should not be consumed. Assuming you practice good, general food safety in your kitchen, there is nothing unsafe about using day-old or previously cut onions. So what's wrong with this picture, I mean if he has to wear a mask, it can't be good right? The problem with this picture is that we have NO idea what it is he is spraying. He could be spraying copper sulfate which is an approved organic fungicide used to treat downy mildew and leaf spot in strawberries AND which requires the use of the respirator. The copper sulfate label does instruct the applicator on what personal protective equipment (PPE) they must wear regardless of whether the pesticide is organic or synthetic. This label requires the applicator to wear a respirator. Labels are the law. The applicator does not want to breathe this stuff in, even if it is OMRI approved. The risk to the consumer eating the strawberries is negligible as growers follow strict harvest rules. If this is copper sulfate, then harvest can take place after 24 hours. Let's be clear, organic is not pesticide free. There are over 2,500 pesticides approved for use in organic agriculture. 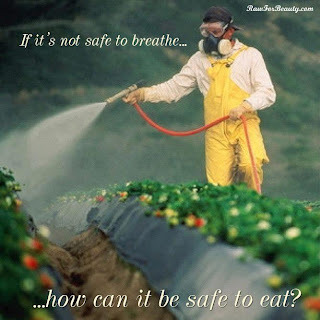 Organic pesticides are also toxic, which is why they are pesticides to begin with! Its the dose that makes the poison, not whether something is organic or synthetic. Regardless of what type of pesticide he is using, he is protecting himself as he should. Bottom line is, we have NO idea what it is he is spraying but we assume the worst of course. 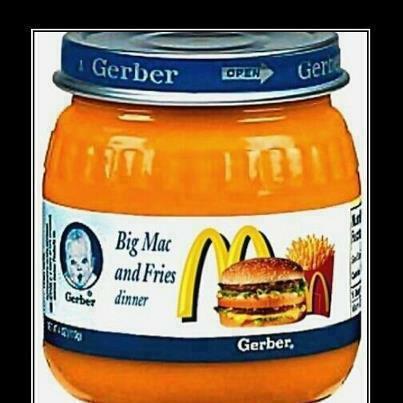 When I first saw this image on twitter, it had "#pesticides #gmo" with it. That would lead you to believe that the strawberries are GMO right? Wrong! There are no genetically modified strawberries on the market so again, we're lead to believe something that is entirely unfounded. This is a good one! Why did Kentucky Fried Chicken change their name to KFC? Here is the internet answer! "KFC does not use real chickens. They actually use genetically manipulated organisms. These so called "chickens" are kept alive by tubes inserted into their bodies to pump blood and nutrients throughout their structure. They have no beaks, no feathers, and no feet. Their bone structure is dramatically shrunk to get more meat out of them. This is great for KFC because they do not have to pay so much for their production costs. There is no more plucking of the feathers or the removal of the beaks and feet." Seriously? Wow, someone has too much time on their hands to come up with that explanation! For the record, there are no genetically engineered chickens in our food supply. 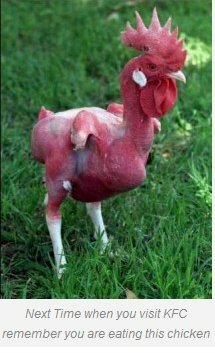 On a different website, I found this claim: "“Chicken are GENETICALLY MODIFIED with hormones, carcinogens, GMOs, corn pills, arsenic and drugs so they become LARGER FASTER and as a result they often CRIPPLE under their own weights." Chickens do not become "genetically modified" by eating anything. Genetic modification is a scientific process requiring transfer of specific genes from DNA. It does not happen by eating. Furthermore, it is illegal to use hormones in poultry production. I'm not even sure what a "corn pill' is. Arsenic has been used in chicken feed as it is an effective treatment for coccidiosis, an intestinal parasitic disease the infects the gut of chickens. According to the FDA, organic arsenic, the type used in chicken feed is not a carcinogen. The bottomline is, none of this statement is entirely accurate and is very misleading and yet it is shared on social media as "truth" to promote an agenda. This image would make you think that A) McDonald's is now serving baby food, or B) Gerber is now producing McDonald's flavored baby food. Can anyone say photoshop? Often times, these images are shared on social media as a joke, a way to get a good laugh out of something ridiculous or silly. But often, I see the messenger promoting these images as "truth", with people or groups tagging and sharing these images who have an agenda to promote. So when you are looking and sharing pictures on the internet, pause a few minutes and think about what the image is portraying and what, if any, FACTS you know about the image. Apply some common sense. Do a bit of research. See if you can find the original source of the image or story and what kind of validity they may or may not have. Perpetuating falsehoods does nobody any favors. Making assumptions about stories or images is nothing more than gossip. Harmless fun is one thing. A misleading campaign is another. So be careful little eyes what you see and then share on social media.